U.S. crude oil production reached 10.038 million barrels per day (b/d) in November 2017, according to Energy Information Administration's (EIA) latest Petroleum Supply Monthly. 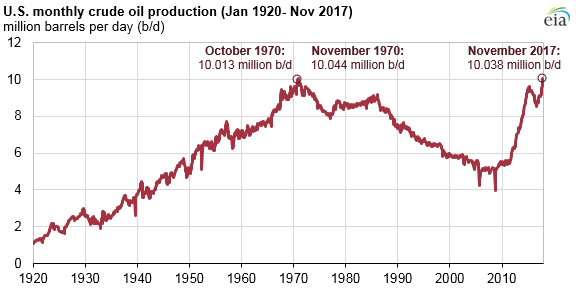 November’s production is the first time since 1970 that monthly U.S. production levels surpassed 10 million b/d and the second-highest U.S. monthly oil production value ever, just below the November 1970 production value of 10.044 million b/d. The production values presented here are based on EIA’s monthly survey of crude oil production, which are considered more comprehensive and reliable values of U.S. crude oil production than the preliminary estimates presented in EIA’s Weekly Petroleum Status Report.